During this past year, BMH Books of Winona Lake, Indiana, has employed a subsidiary rights contractor to leverage its products into foreign language translations, large-print editions, audiobooks, digital versions (Libronix, WordSearch), and more. 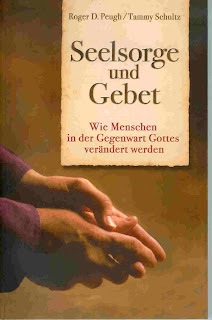 The first of these, a German language edition of Transformed in His Presence: The Need for Prayer in Counseling by Roger Peugh and Tammy Schultz (at right) has now been released by a German publisher, Christlicher Mediendienst. A Portuguese edition of Walking Like Jesus Did by Larry McCall is now on the press, an audiobook licensing agreement for the McCall book is pending, and a contract is pending for BMH’s Edmund Hiebert commentary series to appear in digital form. For more information, contact BMH publisher Terry White at tdwhite@bmhbooks.com.